Facebook has been continuously evolving since its inception in 2004. The world’s largest social media has come a long way with each update working on making human interaction better and increasing user engagement with its interface. Mark Zuckerberg’s recent announcement prioritizing “meaningful interactions” with family, friends and groups now makes ensuring more screen time for brand and publishers’ related organic content trickier. While many brands and publishers are now apprehensive over a possible solution to reach a wider audience and get more engagement, there are quite a few effective digital marketing strategies brands can adopt to increase consumer engagement and interaction. So what does “meaningful interactions” mean? Facebook now focuses on quality time which is measured by defining some interactions as being more meaningful than others. They are of two types – active and passive. Active interactions, like commenting and sharing, require more time and effort on the part of the user and are hence more meaningful as opposed to likes and clicks (passive interactions). Facebook’s new algorithm prioritizes active interactions that inspire users to engage in conversations over passively scrolling and hitting the like button. 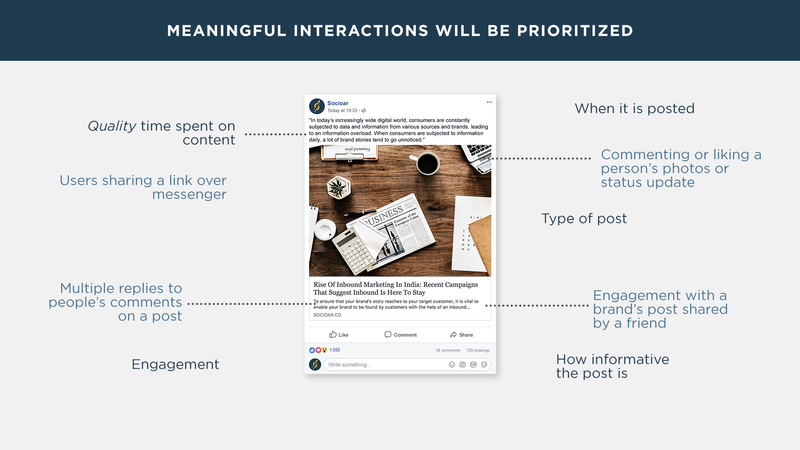 Page posts that prompt conversations between friends will see less of an effect on New Feed features and distribution as opposed to those posts that people don’t react to or comment on. Posts where users can reply to questions, provide suggestions, voice their opinions are more likely to be featured in your target and lookalike audiences’ News Feed. Tip: Incorporate thought-provoking content. Reactions are one of the primary forms of active interactions and a great way of gauging quality content. People repeat what they love doing and they are more likely to engage in posts they love rather than those they just like. Quality is crucial in moving forward and now Facebook reactions – like, love, anger, wow, haha and sad – will factor into the algorithm prioritizing one brand’s content over others’. Tip: Content that attracts more active reactions will warrant a higher boost. Facebook places a great deal of emphasis on public and private content sharing. Just sharing posts is no longer enough. Post shares with friends and family engaging in a conversation will see an increase in their reach. Facebook wants brands to publish content that makes users tag their friends and family to initiate conversations and brings people together. Tip: Create content that sparks user engagement. Once you have your content sorted, you need to know how to increase your organic reach. Here are some guidelines to boost your reach. Create quality content with apt imagery and captions that prompts engagement and comments. Regularly researching on your followers and checking your analytics must be on your weekly to-do list. People tend to believe and follow in the footsteps of those they trust and admire as it appears more authentic and strikes a chord with them. As Facebook will now show more posts from “publishers the community finds trustworthy”, collaborating with influencers to post on their page will lead to more engagement and increased followers. Refrain from goading your followers to “COMMENT, SHARE OR LIKE” your posts. The new algorithm promises to demote posts that use engagement bait to generate more traffic and engagement. With Facebook deprioritizing content from brands, the need to up your ad game is the need of the hour. Make the best use of Facebook’s Ad Manager to expose your brand to the right audience and maximise your Return On Investment (ROI). Facebook’s 2018 News Feed webinar noted that it would be prioritizing local news. Though this works in favour of newer and smaller brands, global companies need to take note and re-strategise their targets. Creating local events, pop-ups or creating geographically specific posts and story can give these brands a head-start. Last but definitely not the least, rev up on your employee advocacy program to fit directly under “meaningful interactions” with “family and friends”. So encourage your work family to share your brand’s posts for a wider reach. 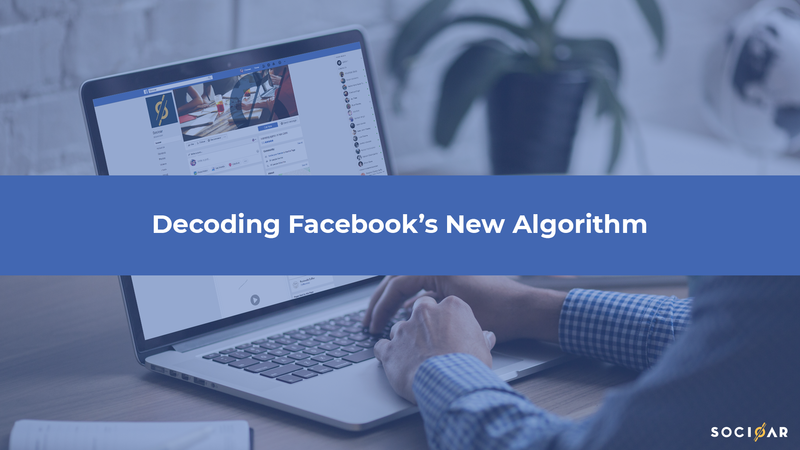 Tweaks and upgrades in Facebook’s algorithm are an ever-changing part a of social media’s nature. Re-thinking marketing and content strategies to stay on top the game are rewarded with increase reach, credibility and maximum ROI. Previous PostPrevious INFLUENCER MARKETING – WHAT? WHY? HOW? Next PostNext Are Infographics more than just colors and information?